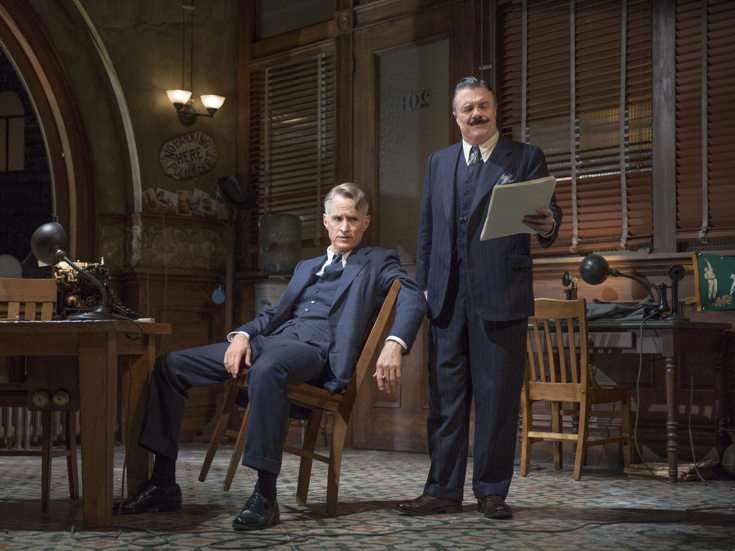 The star-packed revival of The Front Page has recouped its $4.9 million investment, making it the first production of the 2016-17 to reach this milestone. The classic Ben Hecht and Charles MacArthur comedy, this time led by Nathan Lane, John Slattery and John Goodman, is set to play its final performance at the Broadhurst Theatre on January 29. In addition to Lane, Slattery and Goodman, the Jack O’Brien-helmed staging features Tony winner Jefferson Mays, Sherie Rene Scott, Christopher McDonald, Holland Taylor, Robert Morse, Dylan Baker, Patricia Conolly, Halley Feiffer, Dann Florek, John Magaro, Danny Mastrogiorgio, David Pittu, Joey Slotnick, Lewis J. Stadlen, Micah Stock and Clarke Thorell. The Front Page follows tabloid newspaper reporters on the police beat. When reporter Hildy Johnson (Slattery) and his editor Walter Burns (Lane) discover a runaway convict in the midst of a buzzing press room at Chicago's Criminal Courts Building, they conspire to hide him—and keep the delicious scoop for themselves. Nathan Lane, John Goodman and John Slattery headline the starry revival of this classic play.